During my final years as an active Mormon, members of the local hierarchy came to my home to ask me to teach a Men's Sunday Class. When I declined they of course asked why. When my reasons included personal differences with LDS theology and practice, there response was that the Church is guided by revelation and that they had come to my home to call me to teach because of revelation received by the Bishop. When I rejected that idea, their last response was, "The Adversary doesn't have to work on you any longer." Frankly, "The Adversary" is a lazy excuse for not owning one's own immoral (however "immoral" is defined) behavior. Hubris is described as an overweaning pride. Handicapped by an over emphasis on humility as the opposite of pride, I would suggest that, as we see with our current President who can't think of one mistake he made, his attempt to humbly deny any wrongdoing or mistake is an example of overweaning hubris. My own life and professional experience leads me to conclude that men more than women are wired by their upbringing with a tendency to deny immorality as a personal act. I've seen that up close. It is one of the reasons, I suggest, that in this country male politicians have focused more in negative ways in both intensity and quantity on single mothers than the fathers who abandon them. That immorality of abandonment goes right over their heads. It is surprising the number of absent fathers who threaten the mothers of their children whom they abandoned with actual physical harm if the mother applies for public assistance -which in Washington State will lead automatically to the opening and agressive pursual of child support. Driver's licenses and commercial fishing licenses will be revoked for non-support. That is the form of self-focus that Peck emotionally portrays in People of the Lie. There's a story in there of a couple who bought a small rifle for a young man who shortly thereafter shot himself. Being of limited financial means, the parents then gave the same rifle as a Christmas present to the younger brother. When asked about the wisdom of that, they insisted that they had done nothing wrong and that their economic circumstances dictated that such an opportunity to give a gift of value to the younger son justified their act. They would not take any responsibility for the younger brother's inevitable emotional and psychological problems. I agree with Peck when he says that is a greater manifestation of evil than any mythology around a supernatural Satan. Ironically, Peck also writes about his own personal experiences with an exorcism that left me with questions about everything he wrote. The existence of evil in the world remains still in the realm of subjective experience. For that reason, if someone deliberately or out of subconscious habit has included Satan in their personal reality, it seems to be a personally responsible act to own that belief rather than point to whoever taught it or insisted that such is an absolute truth. I have referred to Christian theology and the Bible in terms of mythology, but I consider the greatest and most dangerous Christian myth to be Satan. Elaine Pagels wrote a marvelous book entitled "The Origin of Satan" and I found her research and writing to be essentially aligned with what I already concluded. Satan is a psychological cop out from our very dear Conservative Christian belief in responsibility and accountability. 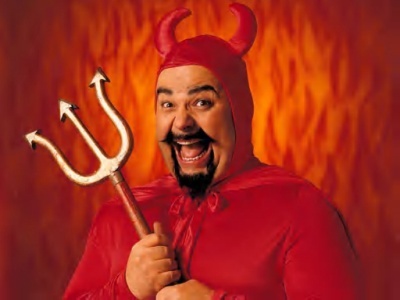 Without reference to how a belief in the devil is taught, many believers find themselves in the position of needing to be "humble" or "modest" and express some sort of orthodox "humility" in a way that engenders an unhealthy fear of excessive pride; that encourages every good personal act to be credited to God and every bad personal act to be blamed on the temptations of Satan.... that in fact encourages us to never go beyond thinking of ourselves as sinners, helpless to change unless/until God intervenes and changes us. What are we to believe about ourselves while we wait for God to say "You're good. Arthur. You ought to give yourself more credit for your goodness and not beat yourself up so much about how bad you are?" The believer is then left in a position of not being able to own either his goodness or his evil. Until you own a thing, you are not its proprietor. Until you own your own life and own up to your bad acts AND your good acts, you do not have proprietorship of what you do. This is the essence of Jesus' teachings and why he emphasized the Compassionate God regardless of what those of imperial Christian bent contend. the temptation to connect evil to deity. I wrote earlier that it seems like historically all who propose a "new" theology invariably give in to the temptation to connect evil to deity. I think this reflects what might very well be one of the shakiest assumptions about god in the sense that assigning creator status to god requires assigning the appearance of everything that occurs within god's created existence as something purposely "placed" or "allowed" by god. (1) Evil revealed in human activity and human decision-making. (2) Supernatural manifestations of evil and assigning the motivation to evil to the will and action of supernatural evil. In the Christian sense, Satan as the polar opposite of God, as I've written before, leaves humans, according to the most commonly preached generic Christian doctrine, caught in the middle. While the Theistic God is author and primary influence of all that is "good", Satan is the author and primary influence of all that is "evil." Accountability for sin leaves a human liable to give credit to God for all the "good" choices made and with an escape clause to blame Satan for all the "evil" choices. There's a strong temptation and tendency to take no ownership of one's own personal choices. God and Satan wind up like two bullies in the playground where all the other kids must choose a side and risk the wrath of the bully not chosen ... or remain neutral and incur the wrath of both bullies. What Should We Do With Satan? “In the Old Testament, he is merely the Adversary, a forbidding member of God’s retinue. How then did Satan become the Gospels’ Prince of Darkness, who brings about the crucifixion of Jesus as part of a cosmic struggle between good and evil? And why did Jesus’ followers increasingly identify Satan with their human antagonists – first Jews, then pagans, and then heretics of their own faith? – From the back cover, The Origin of Satan, Elaine Pagels, Knopf Publishing Group, 1996. To understand our feelings about Satan we must also address our personal cosmic vision first and foremost. We need to understand the assumptions we have made as we internally constructed our definition of both reality and, if we are spiritually inclined, the spiritual world. In mortal or human terms I call that internal image of the spiritual world upon which we have based our Christian religious foundation a "mental construct" – a perceived spiritual reality. That reality is what each of us personally has imagined the spirit world and/or realm of God to be. This construct serves as the context for how we combine our mortal practice of religion with our understanding of God and Jesus. Although for all or most Christians the realm of God truly exists, we do not all agree on what that existence means or how it impacts our lives. For many Christians, the spirit world exists in some other dimension and interacts with our own world in supernatural ways. This is consistent with a view of a purely supernatural, all-wise, all-knowing and almighty God who some times intervenes in the affairs of mortals in dramatic or not-so-dramatic ways. These believing Christians easily accept and live according to the idea of an invisible Jesus/God personage who is vitally invested in human life and directs forces of good against the other supernatural power and source of evil, Satan. Others do not see the supernatural Jesus/God as a personage who exists “somewhere else” and as someone outside the sphere of mortal perception and who communicates spiritually from a distance through the Holy Spirit. On the one hand there are people who talk about spiritual warfare, evoking images of the spirit world as some sort of zone of conflict in which Satan and God operate simultaneously for and against human life. On the other hand, others see Satan more as a conceptual part of their attempts to get a grasp on the idea of the existence of evil. Evil for them is not something we are tempted to do by a supernatural Satan. It is more an active part of life that serves as a kind of resistance or counter force against our intention or tendency to behave in an independent manner – acting in a ways that reflect the "goodness" way that Jesus wants us to be. The same controversy between biblical literalists regarding God as the “Boss of the Universe” who is commanding humans to behavior based purely on obedience and morality as opposed to a non-judgmental God who fully encourages positive human behavior as a consequence of total agency exists around the reality of Satan. To literalists, Satan becomes the direct opposite and yet needful counter to the goodness and righteous-requiring Commander-God; a supernatural reality who tempts mortals to both “sins” of commission and of omission. To non-literalists Satan represents among other things the natural mortal tendency to self-focused, self-interested acts that disregard the good of anyone else. In this regard concepts of laziness, selfishness, arrogance and intolerance, for example, represent the fundamental source of evil in our lives. This is the sort of thing addressed excellently by Scott Peck in People of the Lie: The Hope for Healing Human Evil. Regardless of whether or not a belief in a real Satan is an absolute tenet of one's personal faith, it remains a valid exercise to explore and attempt to understand how and when humans first became aware of Satan and his impact on their actions. Moses never referred to the Serpent in the Garden as Satan or the Devil – in fact never used either word in his writings. Yet many believe totally that the serpent was Satan, "that old liar." The biblical appearance of Satan by name does not occur until the Book of Chronicles and the word “Devil” finally appears in the book of Revelation. Reference to Satan in Chronicles is additionally intriguing in that the context is King David requiring a census. In the book of Kings, this event is described as something provoked by God. In Chronicles, which consists of the post-Babylon reconstruction of Jewish records, it is Satan who provokes David to take a census. As a child I was taught that Satan is a real personage and the spirit-world equivalent of someone like Hitler or Stalin; someone of whom I should be mortally terrified and for whom I should be constantly alert. As I grew older I found myself in the curious circumstance of being caught directly between the goodness of God and the evil of Satan. If I sinned it was Satan’s fault for tempting me. If I did something good, I was obligated to credit God for prompting me. Either way, I was bereft of any ability to own my own life’s choices and actions as something I had brought about due to my own free will. That kind of lack of ownership means a lack of proprietorship for one's own life and is contrary to Jesus' description of loving the Lord thy God with all thy heart, strength and might. You cannot do that if you do not possess sufficient freedom to choose for yourself – thereby effecting your devotion to God freely without expectation of reward. The reward isn't necessary. Satan also serves as the deterrent compliment to a judgmental and punitive God, since – at the bar of judgment – those unrepentant sinners will be consigned to hell and the realm of Satan. My father passed away as what Protestants would label a "back-slidden" Mormon. Shortly after his death I received a letter from a devout family friend who, while offering consolation for the loss of my Dad, also quoted from the Book of Mormon about how those who give in to temptation become captured by Satan who laughs as he enfolds his victims in chains to drag down to hell. Satan is also an essential ingredient for the End Times and Rapture believers. As most good narratives require some sort of conflict for the hero of the story – be it a natural disaster like an earthquake or flood, or an animal like a shark – most narratives utilize a personified villain such as Oil Can Harry, Black Bart, Ming the Merciless or the KGB. Elaine Pages’ marvelous book, The Origin of Satan, is well worth the reading. You need not be a doubter to ponder her work. In fact, if you experience an immediate internal emotional reaction – especially if that reaction is negative or fearful – I recommend you read The Origin of Satan carefully. Give yourself a chance to throw off the chains of an internal mental construct that may have had a serious long term impact on how you perceive the world. The American Christian is a journal based in Bay Center, Washington.